Just in time to save us from the dog days of summer, Faith is back and she's assembling a team to protect the time stream. Our reality is in jeopardy and who better than superhero sci-fi geek Faith to save us all in Valiant's excellent new summer event, 'Faith and the Future Force' #1. You won't find a more relatable superhero character than Faith Herbert. She's demonstrated a fundamental understanding of what it's like to be a geek turned super hero. If anyone knows what it means to urgently jump into a time travel emergency it's a sci-fi fan. When physicist Neela Sethi, the Timewalker, comes calling to help her and her companion, Ank the dinosaur woman, save history she doesn't hesitate. Jody Houser returns with another engaging and exciting adventure featuring Faith just as fun as her regular series. We wouldn't want anyone else leading the charge but a nerd after our own heart. Dr. Sethi's request for help through the time stream openly invokes Doctor Who adventures, one that doesn't go unnoticed and is mentioned among them. The premise of time travel is nothing new and pretty ubiquitous right now, but with Faith at the center, she brings a whole new energy and optimism to the story. Even if you're a new reader to Valiant you can just jump into this fast paced issue and get hooked right away. Houser is joined by two artists - Stephen Segovia and Barry Kitson - and they're the first creatives that will rotate with others as the series goes on to shake up the art each time Faith and Co. enter a new timeline. The transitions here aren't so jarring from one artist to the next, both are very clean with great command of action and perspective. Ulises Arreola's colors are responsible for the rich saturated hues that pop off the page and give life to the greens of the jungle, Dr. Sethi's bronze suit, and the fiery red wig Faith's alter ego, Summer, wear. Like the story, the art is larger than life with big bold panels that move rapidly from one setting to the next. It's a really well-paced adventure that excites. 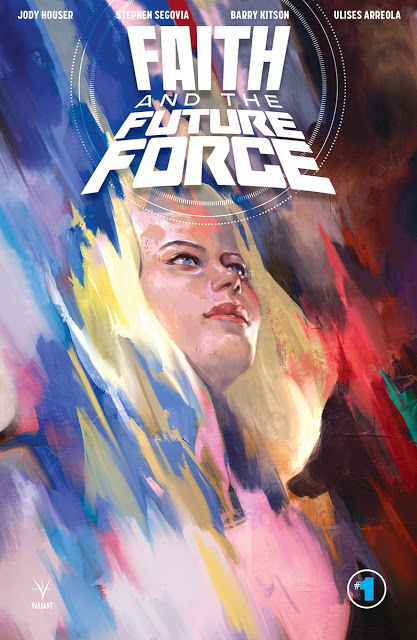 “Faith and the Future Force” #1 opens up the Valiant world to Faith putting her in an all-new adventure that spans beyond her Los Angeles surroundings. It's the perfect summer event that broadens Faith's capabilities, facing new dangers and puts her in charge of her own team. The sense of danger, heroism, and fun is inescapable which makes this series a treat for fans, old and new.